July provides the perfect opportunity to introduce a child to angling. With temperatures high and smallmouth bass feisty and plentiful, kids can readily develop a life long love of fishing during this month. Kids readily learn introductory fishing skills, as long as parents/guardians take the time to provide instruction in a fun and supportive manner. Small “kid sized” rods and reels fit well in tiny hands are well worth the investment. With fun designs like Batman and Barbie a child is sure to go wild when they are unveiled. Even if on a budget, have no worry that any kid will be entertained for hours with a stick having a bit of line and a bobber, hook and worm attached to the end. Equipment for fishing does not need to be complex for kids to have fun, what is most important is the quality time spent with a child in these situations helping them build enthusiasm about the great outdoors. Practice sessions, casting and reeling in lures, are wisely done absent of hooks, until kids develop the control needed to cast and retrieve effectively. Even then, parents/guardians will be wise to keep a watchful eye on an exuberant youngsters back casts. Casting practice is made more enjoyable for kids when you tie a hookless plastic bait (salamanders, worms, crayfish, fish, etc) onto the end of their line. The often wildly colorful lure and wiggling action make it difficult for any kid to resist exhibiting interest. Casting and retrieving on a lawn or driveway, affords a place for instruction that is readily accessible and free of some of the distractions found in more “fishy” situations. Parents need not worry about getting lures stuck in trees, on lake bottoms or anyone falling into the water. Start by having kids cast beyond a specific point, so they can slowly increase their casting distance. As distance improves, have them cast lures into hula hoops to help them improve accuracy. 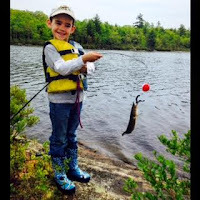 With continued practice, 5 year olds should be able, with guidance, to cast a hooked lure and reel in live fish, eels, mudpuppies, bullfrogs and anything else that bites their hook. With dozens of small mouth bass waters to choose from, in Washington County, anglers constantly inquire about which waters are the best. Over the last 25 years the Jonesboro office of Inland Fisheries and Wildlife has compiled a chart averaging angler hourly catch rates and sizes of smallmouth bass from the highest rated waters Down East. If the list is closely examined a trend becomes apparent showing that the higher the catch rates the smaller the average size of the bass. When fishing with children, they are typically more interested in catching a lot of fish rather than big fish but anglers must decide for themselves which water offers the bass fishing that best suites them. Wabasses (Delorme’s The Maine Atlas and Gazetteer (MAG), Map 35, C-3) and Silver Pug Lake (Map 35, D-5) boast the largest average sized small mouth bass caught with 13.6 and 12.9 pounds respectively. Schoodic Lake (Map 25, C-3) holds the record for the highest number caught per hour, with an average rate of 16 fish. If July temperatures become too hot on inland lakes and ponds, a trip to the coast to fish for Atlantic Mackerel might be more pleasant. The Eastport breakwater (Map 37, E-3) offers the perfect spot for anglers to cast from shore for these delectable fish. If the fish are schooling, success occurs easily with equipment as simple as a basic spin casting reel, medium weight fishing rod, and a diamond-style mackerel jig, Swedish pimple or any other flashy silver lure that can be found in a tackle box. Simply casting into a school of mackerel and allowing the lure to sink for a few seconds before rapidly retrieving is all that needs to be done to catch fish, usually LOTS of fish. Upon landing a fish, immediately cast back into the schooling fish as this will usually lead to multiple hook-ups for as long as the school remains in place. Though not providing quite the same level of “sport”, lots of people fish for mackerel with “Christmas trees,” pre-made rigs consisting of several hooks attached to a main line, designed to catch several mackerel at once. Mastering fishing with one of these rigs requires anglers to manage to get all the hooks full of fish at the same time. Doing so requires not reeling in first fish hooked but instead, allowing it to swim freely about, attracting other mackerel to bite and become hooked on the open lures. Christmas trees serve as a good way to take lots of mackerel in a short amount of time but for the most fun, stick to a single lure as provides the best action-packed fight! As fun as mackerel are to catch, they are also simple to prepare for the dinner table. Mackerel will quickly degrade in July's high temperatures, so anglers should bring along a cooler filled with ice large enough to accommodate the number of fish they intend to catch. This ensures that caught fish remain fresh until they can be processed. Young, “tinker” mackerel require simply removing the head, eviscerating and rinsing with cold water, while larger fish may require the added step of being butterflied so they lie flat enabling more even cook on the grill. Grilling is easily the most preferred method, as Mackerel tends to have a less appetizing “fishy” taste, if the oils are not allowed to drain out as the flesh is cooked. Indian Rock Camps (AKA Camp Clearwaters), located in pristine Grand Lake Stream, will be hosting a completely free week at their camps for children and young adults (up to 40 years old) with cancer and their families. While there exist several children’s cancer camps in Maine, none allow admission by young adults, until now! Jo-Anne and Ken Cannell are happy to host this annual CELEBRATION OF LIFE in loving memory of their daughter Gretchen, who was diagnosed with a brain tumor at the age of 12 and bravely fought this fight for 14 years. 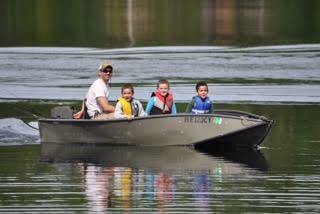 The camp is free to all Maine residents and reservations honored on a first come first serve basis. For more information, please contact Jo-Anne Cannell at 207-796-2822 or 1-800-498-2821. Monthly a clan of loose knaves and eight slim sailors cruelly impaled the greasy foumart with jugs. Every Thursday a cloud of unassuming poets and four disagreeable waiters enormously stroked the smelly ferret with a vise. Beat Summer's HEAT with DULUTH!